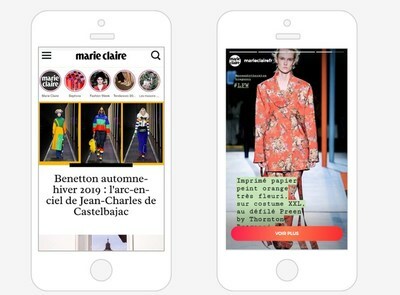 LONDON, April 10, 2019 /PRNewswire/ -- ADYOULIKE, the leading native technology platform, has today announced the launch of Native Stories, a new mobile advertising format, in exclusive partnership with GMC Media, part of the Marie Claire Group. This new 100% mobile experience, unique to the market, is a response to the rise of the 'Stories' format on social platforms. "We are delighted to be the exclusive partner for the worldwide launch of this Native Stories format with ADYOULIKE. The integration of social user experience within a media site, offers real innovation for our business. This is an opportunity for advertisers to be able to deploy content developed for social media beyond platforms and deliver them in a Digital Ad Trust media environment where brand safety is key. "We are excited to unveil our Native Stories product and to partner with GMC Media for launch. Already two million advertisers use Stories on Facebook, Instagram and Messenger. We know that brands want to diversify their investments outside of these social platforms, which more than ever before are being challenged, so we have created a new Native Stories format inspired by Instagram Stories for all premium publishers. "Thanks to our technological know-how, we are committed to restoring a balance between what "walled gardens" can offer and what our premium publishers can offer from the "Open Web" and as always helping publishers to generate as much value as possible for their media brand, by themselves and for themselves, primarily on their own sites. "The arrival of Native Stories on the open web marks a major paradigm shift in that the advertising experience is now fully integrated with the content. This is the ultimate evolution of Native Advertising that we wanted to achieve and that is now a reality." ADYOULIKE is the leading global in-feed native advertising platform. Launched in 2011, it is a pioneer in native technology and creating advertising experiences for users that mirror the websites they are visiting. Using its own native supply-side platform (SSP) and native technology platform, the company enables brands to scale native advertising campaigns across premium publishers, while publishers benefit from access to ADYOULIKE's marketplace and leading artificial intelligence technology. ADYOULIKE has offices in Paris, London, New York, Munich, Madrid, Milan, Hamburg, Manchester and Sydney.